Online casino content provider EGT Interactive has sealed a strategic partnership with the top edge technology provider SBTech. 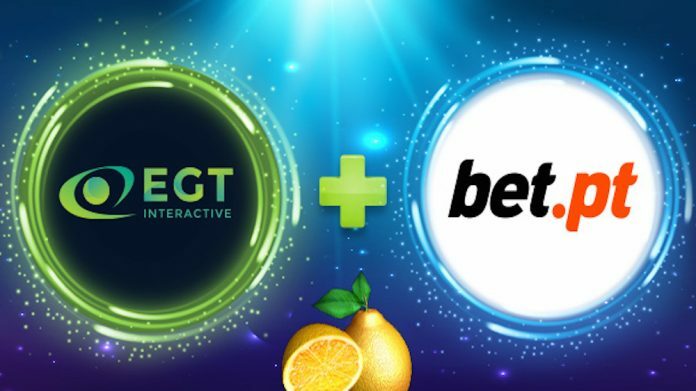 EGT interactive games are already LIVE with the first mutual client, the Maltese operator Bet Entertainment Technologies Limited (bet.pt) with a Portuguese license. The agreement will provide EGT Interactive’s premium igaming content across SBTech’s extensive platform partner network across key European regulated markets, initially commencing with Portugal. Under the terms of the deal EGT Interactive’s complete portfolio of titles certified for the Portuguese market, including its most popular titles 40 Super Hot, Amazons’ Battle, and Shining Crown – all compatible with the four level Mystery Bonus game Jackpot Cards – are already available to Bet.pt players. Bet Entertainment Technologies Limited CEO, Gabino Oliveira said: “We are really excited to have such a promising game content. With this partnership our casino portfolio has now new offers for different players, making bet.pt casino one of the most complete offers on the Portuguese market”. Andrew Cochrane, Chief Development Officer, SBTech, said: “We are continually breaking new ground in regulated and newly regulated markets and I’m delighted to see us expand our casino offering further in Portugal with our partnership with EGT Interactive. This partnership demonstrates how SBTech focuses on key markets to deliver competitive advantage to its partners. We are very much looking forward to working together and developing our partnership further in multiple regulated markets”.